For a preview of this kit, containing a scan of the sprues, see here. Series I: Single FIAT 6.5mm Model 14MG; track tensioning wheel and idler on same bracket, like this. Series II: Two FIAT 8mm 18/35 MG; track tensioning wheel on own support, like this. The CV35 was basically the same vehicle but with riveted hull. A good number of tanks from the first series were re-armed with various types of gun, including a 20mm Solothurn anti-tank rifle or a Breda 12.7mm MG. Flame-thrower variants also existed (cf. kit # 720004). A radio version was also produced, as was a bridge-layer. Prototypes of a tank-destroyer carrying a Breda 47/32 gun and a recovery vehicle were also tested. 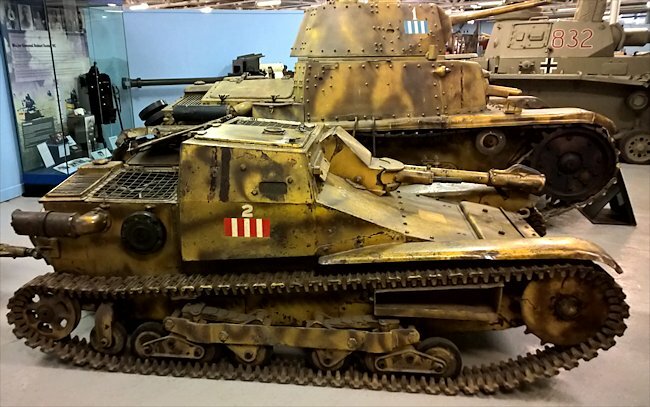 These tankettes were exported to a substantial number of countries and the last were phased out from Italian (police) service in 1952. As this is a small kit, with a small number of parts, it won't come as a surprise that this will be a small construction review. I started by removing the bigger parts and cleaning them up. This was an easy affair with only the tracks demanding a bit more work due to the large number of attachments to the sprue. As there is a (minor) seam running down the middle of the tracks, it is a pain to get rid of it without damaging any of the fine detail on the track faces. I mated the upper to the lower hull, trapping the MG mount, which remains mobile after assembly. Little glue was required and fit was perfect. Note that the plastic that S-Model uses is very soft and overzealous use of glue is a sure recipe to ruin some of the finer details. The tracks can be attached to the hull without glue, which aids painting them enormously. Still, I decided to add just a small drop of glue to the rear attachment to ensure alignment. As you can see from the pictures, there is no interior, although the hatches can be opened. If you put a figure in the hull, not much extra work will be needed. If not, some additional detail might be welcome. The tiny roadwheels are a pain to paint. This is not really a fault of the kit, but the ready-assembled suspension doesn't help. 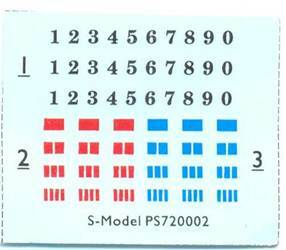 S-model gives us a tiny decal sheet. The Italian "colored bar" system is well-known, but I am at a loss how to use the numerals. They are on a single carrier film, by the way, while the bars are on individual carriers. The decals look thickish on the sheet, reminding me of Hasegawa decals, but once applied they seem to have "normal" thickness. What can't be seen on the sheet is the white between the bars. Once applied it becomes visible, and you discover that the white is slightly out of register with respect to the red, and that the edges are somewhat ragged. (Without actually applying the blue bars, I can't tell if they suffer from the same defect.) My references show that (at least some of) the vehicles carried the bar-markings in four locations, while S-model gives you only three. 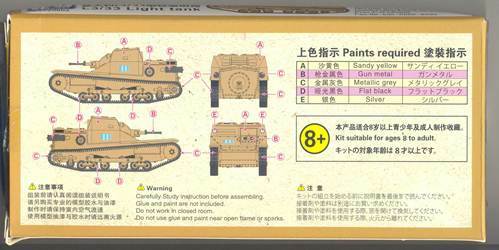 Also note that you cannot build the two vehicles inside this box in markings of the same unit, due to the lack of sufficient decals. At this point the kit is mostly finished, except for some weathering and varnishing. My second vehicle was completed as a Bulgarian vehicle, using the Bison decal set. 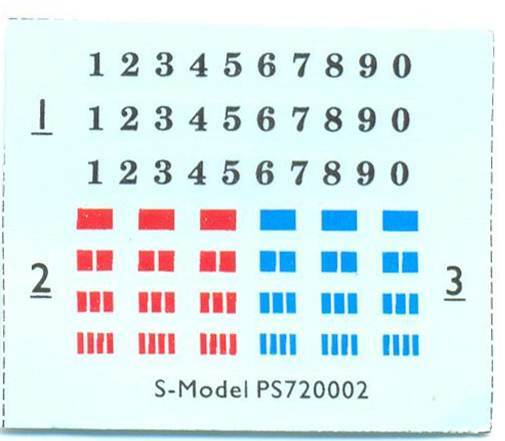 This set gives you two color options and two marking options, and while it mentions that the vehicle carried a single Schwartzloze MG, it shows the suspension of a Series II vehicle, while the real vehicle was a Series I. This meant that I scratchbuilt two tiny suspension brackets and an MG. The twin gun mounts were filled in and a single central hole drilled out. I added a small towing eye to the nose plate. I chose the marking option "01". I noticed that the two decals for "01" were slightly different and had no indication which one had to go left and which one had to go right. Some people have criticized the lack of bolts on this kit. My references show that the CV33 had no bolts, except on the front plate, as per this kit. The CV35 had bolts all over. Detail on this kit is astonishing, given the size of the kit and the fact that is marketed as a fast-build kit. Most pictures show two spare roadwheels of different size on the side of the hull, whereas the kit only has one. (One of those wheels is probably the track tensioning wheel.) Note that this spare wheel has no locating peg in the kit, so you have to eyeball its position. Pictures of real vehicles show 4 tiny bolts on the rear vision on the rear vision flap, which the kit lacks. The smallest of the two circular covers on the rear plate should be more dished than the cylindrical scape in the kit. The inner corners of the fenders appear to be more rounded in pictures of (some of ?) the real vehicle than they are in the kit. A small towing eye is missing from the nose. I don't know if all vehicles carried it, but it looks like they did. I only added it to my Bulgarian vehicle as I caught this little detail too late. Track detail is a little simplified, which can be forgiven when taking the size of this kit into account. Note that, if you don't want to simulate the lenses of the headlights, you can always "cover" them with a canvas cover that only left a small slit. One of the kits in the box was my first experience with an S-model kit, and I liked it a lot. Five years later, I built the other one and still enjoyed it. They are nicely detailed, tiny kits that are perfect as an in-between project, requiring only a few hours of work to turn them into a more than respectable addition to the display cabinet. 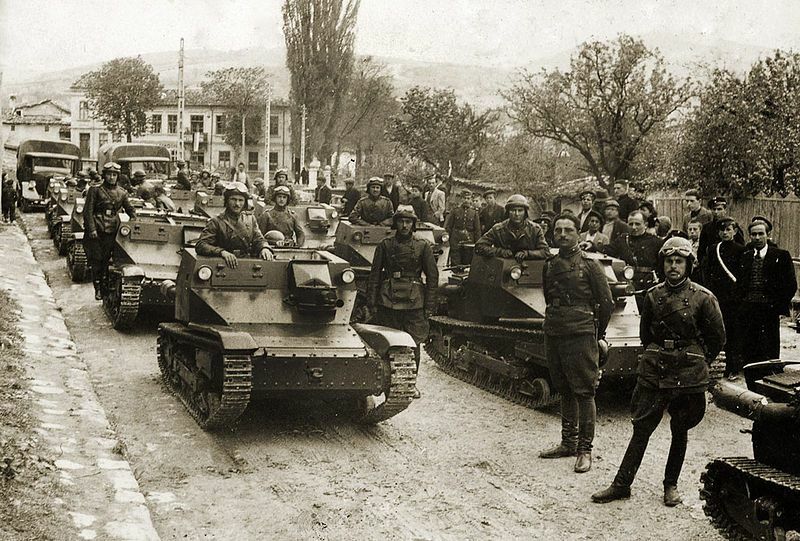 Italian Armored Vehicles of World War Two, N. Pignato. Squadron/Signal Publications 6089. C.V.33/35, J. Ledwoch. Tank Power Vol. LXXXIX (330), Wydawnictwo Militaria. Italian CV33/35 (L.3) Tankette. AFV Interiors. Original website now defunct. Currently in a new format.